Who’s that giiirl… It’s Jess! Because sometimes I just feel like Jess from New Girl. 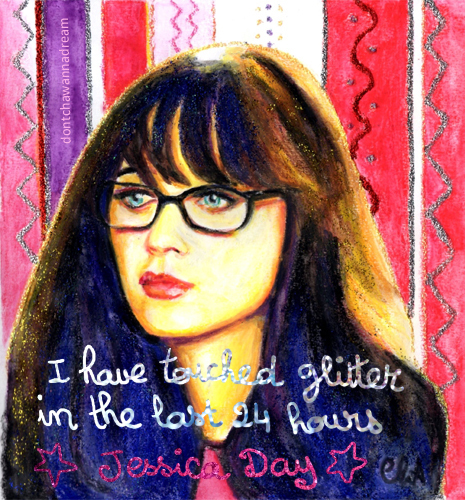 I just found my new year’s resolution for 2014: adding glitter on more paintings. ‘Cause you know… glitter! Ahah I just love it. I used water-soluble wax pastels, a little bit of white gouache, glitter glue (!!!) and Photoshop for the quote (I wrote it with my tablet). thanks a lot, Prenin!! Take care. There used to be an old TV series call That Girl. It was pretty good! And I forgot to say she looked something like your painting! Love it!!! I am a huge fan and you did a wonderful job on this!! hahah Glitter!! Wasn’t that a bad jlo movie? hmmm… or Mariah Carey… ? don’t remember. Genial tu pintura como siempre Cha. Every day your paintings are even better. Great, great work! Wooow. Awesome comment!! Thanks so much, Nuno!! Excellent! Really enjoy the look you produced here – wonderful painting! Thhhanks, Mary!!!! 🙂 Merci beaucoup. merci merci, Christy!!! So cool you watch the show too!! It’s hilarious.